United States' Danielle Collins celebrates after defeating Germany's Angelique Kerber in their fourth round match at the Australian Open tennis championships in Melbourne, Australia, on Jan. 20, 2019. 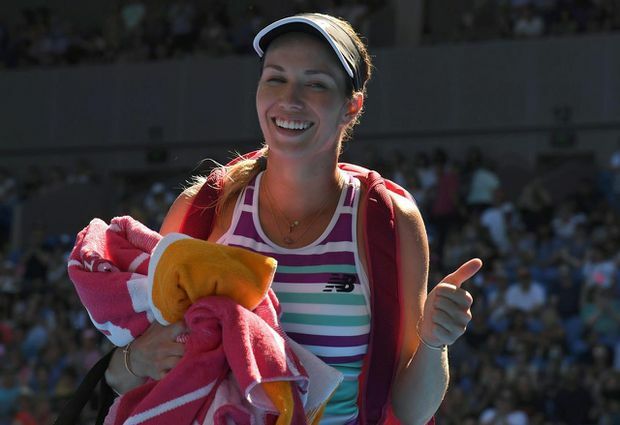 Danielle Collins, who had not won a match at a Grand Slam tournament before this year, pummeled second-seeded Angelique Kerber in the fourth round Sunday, sealing the most stunning result of the Australian Open with a 6-0, 6-2 victory that took just 55 minutes to complete. Collins commanded the match from the beginning, dictating play by aggressively attacking, particularly with her two-handed backhand. She hit 29 winners in the match, compared with just six for Kerber. Kerber, a three-time Grand Slam champion from Germany, had few solutions for Collins and was unable to use her counterpunching to wrest control of the match at any point. After losing the first set in just 20 minutes, Kerber walked off the court of Margaret Court Arena in an apparent effort to change the momentum of the match, leaving Collins grinning as she waited. Kerber won the first two points after she returned, playing with a renewed purpose and shouts of encouragement to herself, but Collins again announced her presence in the match by screaming, “Come on!” back at Kerber after hitting a drop-shot winner on the third point. Collins’s pugnacious attitude is well known in tennis, and something she readily acknowledges and embraces, calling it “just part of the deal with me” on court. The tenacity in her tennis extends to off-court pursuits as well. That unshakability was clear as Collins closed out her victory. Kerber broke in the first game of the second set after their verbal exchange, but Collins broke back in the next game, and then pulled ahead of Kerber for good when she broke again for 4-2. Mat Cloer, one of Collins’s coaches, said that she had played “pretty flawless” in the first set and did what she needed to retain the momentum. Collins, a two-time national champion in singles for the University of Virginia, is the first collegiate player to reach the quarter-finals of women’s singles at a Grand Slam event since Lisa Raymond at the 2004 Australian Open. “I think going to college helped me develop myself as a person,” Collins said. “I really know who I am, the type of person I am, what I want, what I want to do with my life, what I want to do with my tennis. Collins did her homework before the biggest victory of her career, watching footage of Kerber’s matches. Collins has been a quick study in the elite levels of professional tennis. Ranked 162nd a year ago, she broke through with a run to the semi-finals of the Miami Open last March, beating Venus Williams en route. Collins, now No. 35 in the rankings, will face 44th-ranked Anastasia Pavlyuchenkova on Tuesday for a spot in the semi-finals after Pavlyuchenkova upset No. 5 Sloane Stephens, 6-7(3), 6-3, 6-3. In other matches, Ash Barty beat Maria Sharapova 4-6, 6-1, 6-4 to reach her first Grand Slam quarter-final and gave Australian its first woman that deep in its major tournament since 2009. Two-time Wimbledon champion Petra Kvitova advanced to the quarters after beating 17-year-old American Amanda Anisimova 6-2, 6-1 to open play Sunday at Rod Laver Arena. Simon Goffin, Pavlyuchenkova’s coach, said he knew Collins could rise to the occasion of an opponent like Kerber. Collins did not moderate her hopes for the next match. “Hopefully, another amazing match of tennis for me,” she said in her on-court interview, one of several answers that drew startled gasps from audience members not used to such unapologetic self-assuredness. Collins said she was animated by antagonism.